You have hundreds of camera manufacturers to pick from. Which one should you use? This is a tough but critical question impacting both integrators and users as it impacts product availability, training, discounts, support policies and more. We surveyed integrators around the globe to better understand how many manufacturers they carried and, more importantly, why they made the decisions they did. In this note, we analzye and share more than a dozen integrator comments. As the chart below shows, despite there being hundreds of manufacturers, overwhelmingly integrators regularly use only a few. Applications covered: A number of respondents answered that their main line covered the vast majority of their applications, but they turned to a second for specialized cameras, such as multi-megapixel or PTZ, or when their main line was outside the customer's budget. Ease of support: Keeping the number of camera manufacturers to a minimum also helps to ease support costs. Less technician training is required, and efficiencies gained since installers are used to using a limited number of models regularly. Repairs and replacements are also simplified, since fewer models must be known and stocked for service calls. "I have stuck to minimal manufactures as I have found some to be better in some areas than others. Rather than have a big mix of cameras in the field, a smaller mix has enabled me to maintain constant expectations of performance as well as reliability. It has also enabled me to negotiate better purchasing pricing which is able to passed on to the end user." "Right now we install Sony & Panasonic pretty much exclusively with Sony being the majority. We are looking for a more cost effective solution for those jobs that are determined by price. We are comfortable with the quality and reliability of these lines even though the cost is higher than some others in the market. If we find the right line then we will definitely take it on. We just had issues in the past rolling out a big job with a new product and we had a high failure rate among some other issues. So it has been difficult for us find something else. Probably within the next few months we will be adding at least one more manufacturer to our arsenal." "We are trying to keep our portfolio as narrow as possible, it would be best to have only one manufacturer, but customer likes to choose from few alternatives and looks suspicious, when you can't offer any alternatives, so 2-3 manufacturers are optimal. Another point is product range, often only combining different manufacturer's products you can get good results." "We try to limit the number of manufacturers so our techs remain well trained. However, we do understand that every application demands a unique solution and there isnt a catch-all product to satisfy every application." "95% of our cameras are deployed with Axis and Panasonic. We have recently picked up the Sony line as well, but that is about it. I do not like having too many 'lines' to support. I know that cameras are just 'edge devices', but they have complex feature sets that need to be configured for different applications, and our installers need to know which features fit each application." "Keeping the number of manufacturers that we use to a low number has always been difficult for our company. We've always wanted to be everything to everyone, but spreading yourself across multiple manufacturers when it comes to IP video is very hard to do. On the technician side, keeping technicians trained on multiple models from multiple manufacturers is next to impossible. Installation suffers which causes a poor performing system which then creates an unhappy customer. Its important to have your installers be experts with every piece of product. On the business side of things, it is important to make sure you have the best purchasing power for the times when you need to really compete on bids. If you are selling thousands of a manufacturer's product, they are more likely to give you a deal at certain times than if you were just selling a hundred or so." "No one manufacturer fits all scenarios, but two (Sony and Arecont) seem to fit 99% of all aspects including price, type, and quality of pictures. Where one comes up short, the other seems to fit the bill." "We are a very service-centric and process oriented company. We made the decision to not take on too many manufacturers so we could make sure we have service stock and the knowledge to install and service what we do provide. We've also found that installing multiple manufacturer cameras on the same site causes problems both aesthetically to the customer and differences in video quality." "Although there is a wide variety of manufacturers to choose from when it comes to IP cameras, when we have a choice of what cameras to install, we regularly deploy mainly Axis and Panasonic cameras. We have evaluated many different brands of IP cameras and have found these to be superior products with a great variety of different models and styles, excellent feature sets, and outstanding customer and technical support with a very low number of cameras that need to be returned for repair.. We are an Axis Gold Channel partner and have found having Axis as a partner has been very beneficial to our sales and installations." Wide selection was the key determining factor for those regular using four, five, or more manufacturers regularly. The ability to choose from numerous manufacturers and models is beneficial when customer or specifications demand it. However, supporting a larger number of manufacturers is likely to increase training costs and installation time, as technicians spread their time across more lines. "I think we have (and still are) looked at everybody on the sun. I think having a wide variety of cameras give us flexibility to design a quality and affordable solution for the client. Carrying a ton of lines really makes us a unique video VAR. If we have less lines, you limit yourself on where you can compete. We like the idea of being a best of breed integrator since we can take the best of each line and give the end user what we think will give them the best image quality for their site. Some lines you need for performance (Avigilon, Bosch, Axis, Sony) Some lines you need for cost effective reasons (Vivotek, ACTi,). Also some lines like Samsung no one really carries so it makes you unique in that sense too. The last set of lines you need to meet spec (Panasonic, Arecont, & Pelco) Some of this is because the marketplace is all over the place and every job is different with the end-user having totally different expectations on each job. However on our analog we have been all over the map too so this is nothing new really since Pelco began to falter many years ago." "Because we regularly use cameras from more than 5 manufacturers. We use that many because we strive to meet customers at their need. If they have specified a particular manufacturer, we use that. If they need to meet a particularly tight budget, we look for products to fit that. If their existing infrastructure demands one over another, we use that. If we can make better margin and still keep the customer happy, we'll perhaps use something altogether different." "We like our independence in camera manufacture which allows us to pick the right camera for the right application. That could be price/performance based, WDR or lens needs for example. We use Acti, Arecont, Axis, Panasonic, and Sony most often." "The camera choices are driven by application requirements, bid specs, cost and performance. IMHO no one company has the best camera for all applications. We would like use as few as possible but the early promises of "universal IP compatibility" were ludicrous at best. We also cover a wide range of applications from residential to commercial, retail, institutional, MDU and they all have varying requirements. Within those segments you have "cost conscious" and "I want the best" variations which further drives the adoption of multiple camera lines. Between the 4 brands we focus on we have pretty much covered all of you application requirements to date." 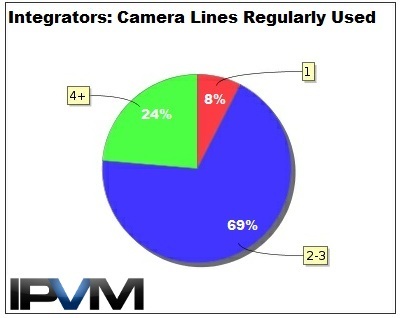 Very few integrators answered that they were using one camera manufacturer only. These respondents answered that their main line has not created issues for them and fit most applications, so they turn to other manufacturers only occasionally. "We have NEVER had issues with Mobotix. In the environments we do installations, PTZs are impractical and often fail due to either a heater/fan issue. We have been extremely pleased with Mobotix, but are considering other brands given their lack of protection in the channel." "95% of the IP cameras we use are Bosch. Our market is perimeter security where night shots are very important, we have had very good results with Bosch so stick to that. Given this we generally install Bosch internally also, using a limited number of part numbers also makes support much simpler." On the positive hand, rarely do integrators limit themselves only to a single manufacturer. However, as these practical considerations show, since it is difficult to carry many lines, integrators usually limit themselves to a few. While this helps them be expert in deploying and servicing those cameras, it also may mean that some will not recommend a camera even if it is overall better for an end user's needs.